Swapping business cards at networking events has become such a passive, impersonal interaction for a lot of people. These are the same people that will say “business cards don’t work”. So how do you make business cards “work”? The answer is: you don’t. You do the work. Let’s be sure we’re clearly defining a few key points. A business card is NOT magical currency that will generate new business for you. A business card is NOT a marketing or advertising tool. It’s a networking tool. A business card is a vehicle to deliver information to a prospect you’ve already made a connection with. If we respond to a business card without making a connection with that person; it has to be an awesome business card. An awesome business card is well designed, creative, great print quality, and good use of special printing applications like foil, embossing, letterpress, spot uv, etc. But we’re print geeks over here at Legit Print, so that’s a unique case. Have you been in a situation where you meet somebody, they shake your hand, pretend to listen to your introduction, hand you a business card, and walk away? We call these people victims of bad swaps (#badswaps). It’s a horrible practice that’s affecting the way we view and use business cards. So how do you prevent being on the receiving end of #badswaps? Well, the thing you should have in mind is that your time is valuable. Don’t let someone waste even 2 minutes of your time if they’re not interested in genuinely connecting with you. Chances are; these bad swappers aren’t aware that their efforts are not effective. So help them. 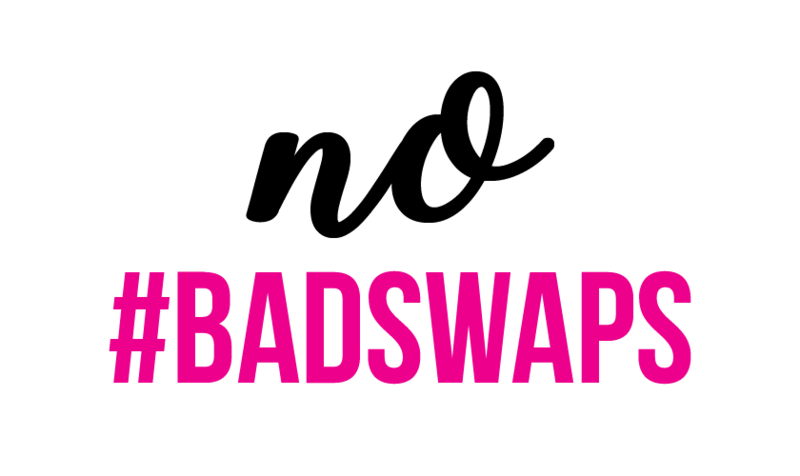 Call them out on their #badswaps. Don’t let them hand you that card and try to ease away. Ask them “So, you’ve told me what you do, but why would I contact you? You’re a graphic designer, I know tons of graphic designers. Why would I contact you?” It may seem brutal, but it gives them a chance to think about it and redeem themselves from their #badswaps. At Legit Print, we actually recommend our customers print a lower quantity such as 250 or 500 business cards. Finishing a box of 250 business cards is a lot more reasonable than printing a box of 1000 business cards. If you’re printing business cards in large amounts, you’re probably going to networking events and trying to get rid of them as quick as you can. That’s why printing high quality business cards like spot uv business cards, silk business cards, or velvet business cards at a lower quantity will probably give you better results than printing standard business cards at a large quantity. Adding special effects to make foil business cards, spot uv business cards, embossed business cards, or die cut business cards, has a high return on investment. It’s about making an impression with quality rather than getting your business card into as many hands as you can. Printing postcards and flyers are often the opposite scenario, in which you probably want to print and distribute a bunch of them at a time. Legit Print Products: Spot UV Business Cards, Silk Laminated Business Cards, Foil Business Cards, Velvet Business Cards.